After 15 years of research, development and testing, we are proud to offer the revolutionary StoveCAT ECD Emission Control Retro-Fit Device for all wood heaters. 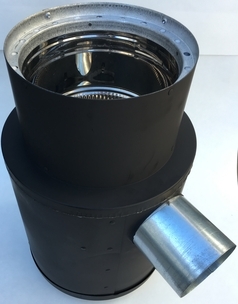 The StoveCAT ECD simply attaches to the vent pipe on top of a wood stove to direct the pollutant filled exhaust through a state-of-the-art catalytic assembly. 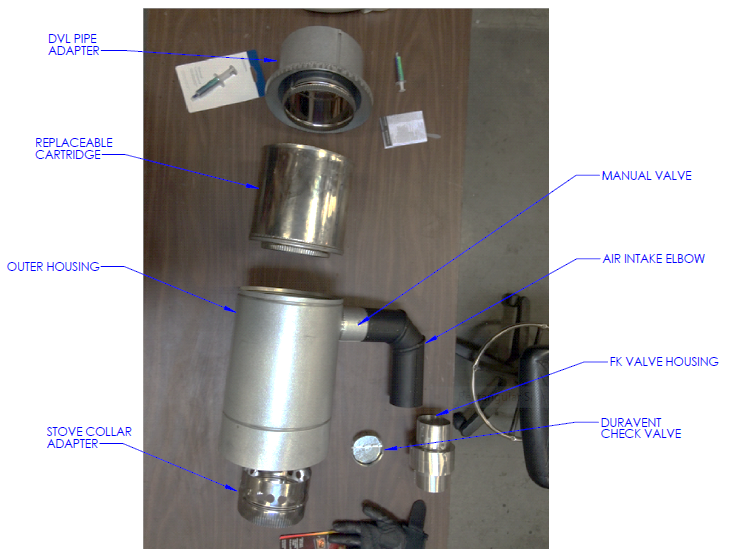 When the exhaust temperature exceeds the required catalyst light-off temperature of about 380 degrees F, the catalytic components convert the organic particulates and other criteria pollutants into harmless water vapor and carbon dioxide. Powered by a Clear Skies Reticulated Structure. See StoveCAT Components. 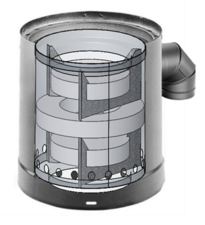 The StoveCAT ECD Retro-Fit Device is powered by a patented Three Stage Catalytic Cartridge. The most important feature of our three stage catalytic system is that the wood stove exhaust will continue to flow even if the catalyst becomes totally blocked with organic particulates. This is critical to insure that no spillage occurs under any conceivable situation during wood stove operation. If there is any buildup of organic material on the catalytic components, it will be burned off during the next high-burn period resulting in a self-cleaning device requiring no maintenance or replacement for at least 5000 hours of operation. In addition to reducing harmful particulates and gases, a key feature of this device is that it increases the energy efficiency of the stove. It does this by breaking down organic compounds in an exothermic reaction - a chemical or physical reaction that releases heat. It produces heat energy in a manner that needs less energy to create the reaction than the amount of total energy released. This additional energy is produced by the catalytic combustion of the organic compounds that are normally expelled into the atmosphere as pollution. Much of this catalytic energy will radiate back into the living area as radiant heat. More energy and less pollution. According to US EPA, approximately 10 million wood stoves are currently in use in the United States, and 65 percent of them are older, inefficient, conventional stoves. Just 20 old, non-EPA certified wood stoves can emit more than 1 ton of fine particle pollution. In many areas of the country, wood smoke is the single largest source of PM 2.5. The StoveCAT ECD is designed to solve this environmental crisis. It is designed to work on virtually any wood heating device with a flue system of 8" or less. 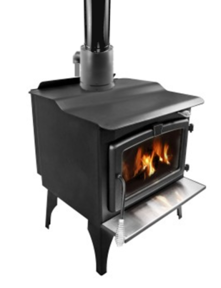 There are hundreds of different wood stove brands and models. 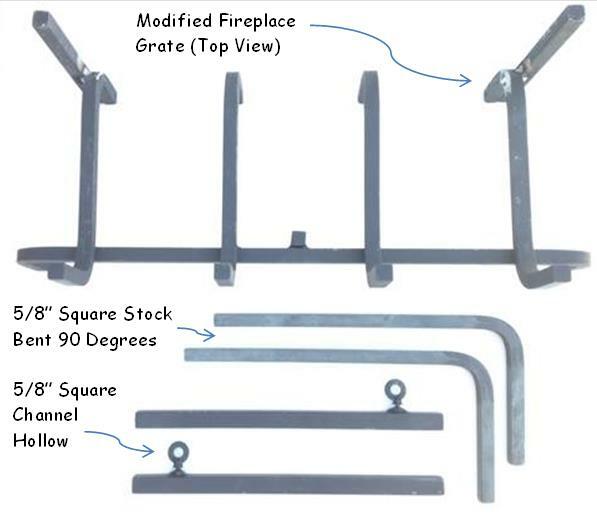 A simple stove collar is used to transition from the exhaust of the wood heater to the bottom of the emission control device. This device can be easily installed in about an hour. Special adapters may be required for certain appliances. The StoveCAT ECD has also been successfully evaluated on indoor wood furnaces. The StoveCAT ECD was tested at Omni Environmental in Portland, OR. The total reduction in particulate matter averaged 80% compared to baseline measurements from two different wood heaters and the average moisture content of the fuel was above 30%. Additional testing showed 80% reductions in PAH, VOC's and a 60% reduction in CO.
Test Report available upon request for Air Quality Regulators and Agencies. 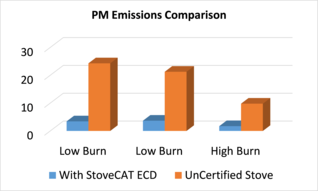 Why Choose the StoveCAT ECD ? 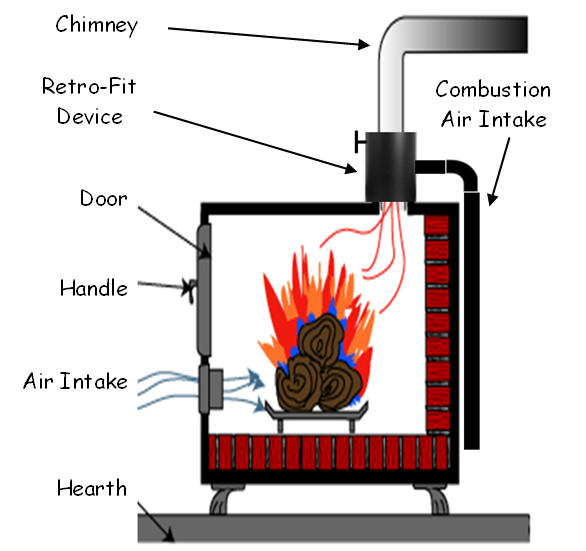 For many years, the US EPA and Air Districts across the US have been searching for a device or system that can be retrofitted to existing freestanding, uncertified, residential wood burning stoves that will significantly reduce the emission of fine particles (PM2.5) and polycyclic aromatic hydrocarbon (PAH) pollutants. They also wanted the device to be economical and easy to implement and not create a hazard to the occupants of the house or harm the environment in any way. We are proud to offer the StoveCAT ECD Emission Control Retro-Fit Device as the solution for all wood heaters. The StoveCAT ECD is the ONLY passive system available to reduce wood heater emissions. Several other technologies are available that have computers, blowers, heaters or other complex system requirements. All of them require electrical power or maintenance. The StoveCAT ECD is totally passive with no moving parts and no power required. The The StoveCAT ECD is also the least expensive system to purchase and the least expensive to operate. The StoveCAT ECD also produces additional thermal energy. Much of this catalytic energy will radiate back into the living area as radiant heat. More energy and less pollution. Please send us an email. 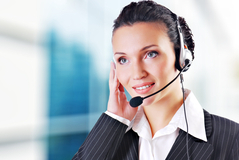 We can provide you with pricing, literature and test documentation. Call our office directly at 951-264-8725. Thank You!